The new house has a revolving door apparently. It’s funny that we’ve had more visitors in the month that we’ve lived in the new place than any month we lived in Tulsa. First Hillarey and Lance visited for my birthday. We had a great time and I think the kids love the new place as much as we do. Then my sister brought my parents out for a look-see. My mom kept ooohing and ahhing and telling us how much she liked it. It was a family fandango for a while there. Then we invited our friends Emily and Mike to visit so I could make up for missing Mike’s birthday party. They had seen the house during several of the building stages and were eager to see the finished project. Chris received an email shortly thereafter from a visitor we didn’t expect or know. 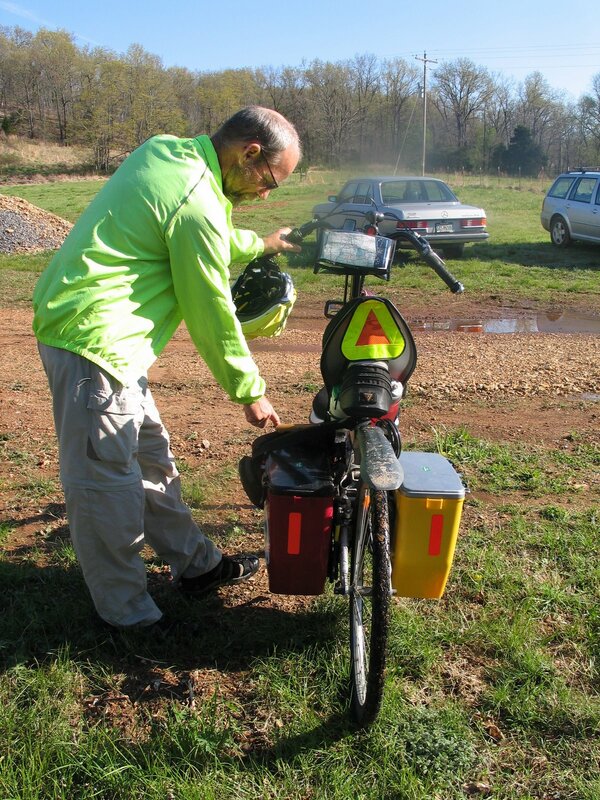 Several years ago while bicycling on our tandem we joined a group called Warm Showers, which provides you with a list of names and phone numbers of people who would host touring cyclists in their home for a night – providing a meal and you guessed it – a warm shower. Our first Warm Shower guest was coming through Oklahoma sometime between Saturday and Monday. Emails zipped back and forth and Chris and I got excited about David’s visit. David Byrne is on his second world bicycle tour. The first was in 1975 shortly after finishing high school. David traveled two and a half years crossing all of the latitudinal lines and visiting 29 countries. Thirty-four years later David has decided it’s time to undertake another big trip — he’s recycling the world. This time around he plans to cross all of the longitudinal lines. There are only two points where David’s path will cross the original trek — his hometown in Minnesota and his birthplace in France where his parents were stationed after WWII. As it happens Emily and Mike were scheduled to visit the same evening that David was scheduled to arrive. Since Mike and Emily have traveled many of the countries that David has been or will be on this trip we thought it would work out great. David arrived first and settled into the old farmhouse. A bit later he and Chris were discussing travel options between Oklahoma and Houston, Texas that would provide a shoulder to ride safely out of traffic, offer camping possibilities, and some scenic enjoyment when Emily and Mike arrived. After a quick tour of the house we all joined around the table and enjoyed a simple meal of quiche, kale, and stuffed mushrooms, with Tiramisu for dessert. Talk flowed freely of travel, movies and the personal histories and stories that make pleasant conversation a memorable experience. The next morning after breakfast Chris took David next door to see the monastery before David climbed back on the recumbent bike for the day’s journey to Robber’s Cave. Below are a few photos I took of David and his gear. You’ll notice there isn’t much in the way of gear. David is traveling light – really light. One pannier is for clothing the other holds his sleeping bag and hammock, along with a few essentials. There’s one small daypack slung across the bar and secured to the pannier. 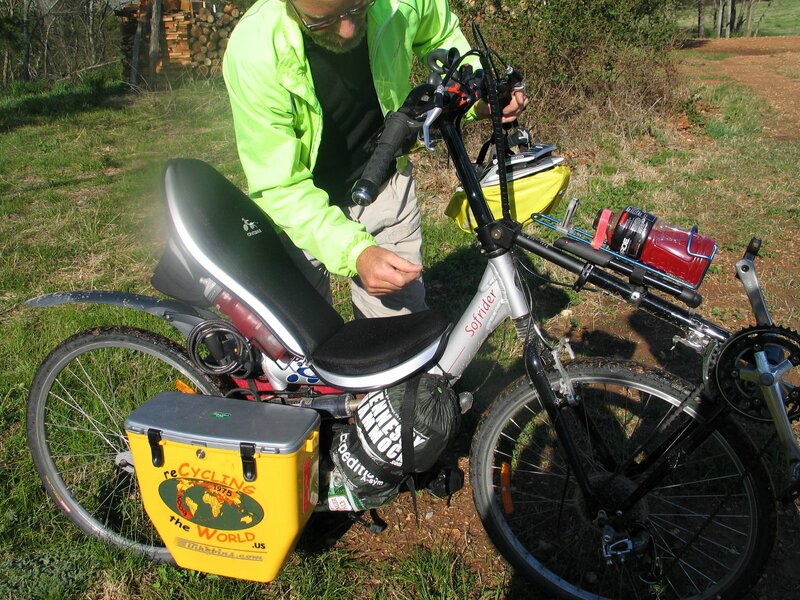 A small bike bag rests under his seat and a crumpled plastic soda bottle holds and protects extra tire tubes and parts. The gear is impressive. Or should I say the lack of paraphernalia? A former boss of mine, John, used to tell us how he longed to be able to pack everything he owned into one suitcase. While we just finished building a new house and I continue to buy more yarn than I need, I understand this desire. Mobility is so much simpler when you live lean. A few possessions are easy to pack and go when the urge to travel presses upon you. 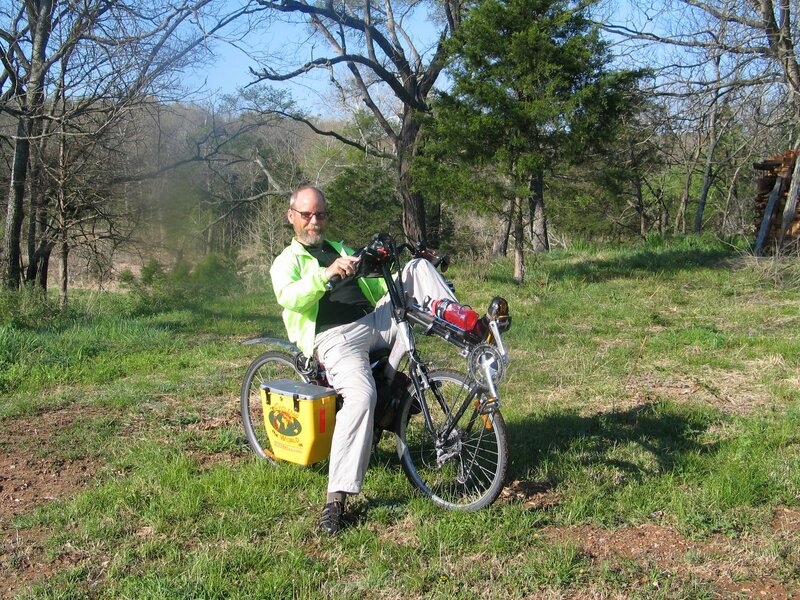 David is a retired UPS driver and his wife Julie, is a teacher and also a bicycling enthusiast. Julie, who is taking a two-year sabbatical, will be joining David in Columbia for the rest of the tour. Yesterday Chris and I went back to work with errands and tasks usual to our life. But for me, and Chris too I think, my mind keeps wandering about skinny spinning wheels and the feel of the road a few inches beneath our pedals. Maybe we’ll tackle the west coast from Seattle to San Francisco on the tandem next….